Mea culpa, mea culpa... 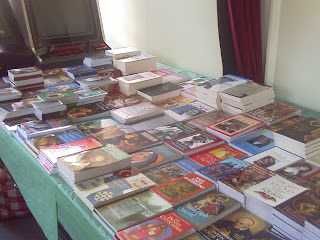 I just couldn't resist the lure of the bookstall. I think the Day With Mary team see me coming, because they put out different stuff each time, and are very quick to point out books I might have missed... as well as being terribly helpful when it comes to obtaining books which seem to have been left behind. So, what have I managed to find this year? I'm really excited about this one. Having devoured Joan Carroll Cruz's books, "The Incorruptibles" (about incorrupt saints) and "Eucharistic Miracles," this book should be an absolute gem. I look forward to reading more about Guadalupe, Akita and other miraculous images. The book covers 100 portraits and statues. I've also managed to lay my paws on this: The Blessed Sacrament, by Fr. Faber. He wrote some pretty nifty hymns, and I liked the book I read of his on Purgatory. Plus, we can never get too much information about the Blessed Sacrament. ...Oooooh! What was I doing 22 years ago? Not reading anything by Cardinal Ratzinger, that's for sure!! Saints and Sinners of Calvary, by Fr. 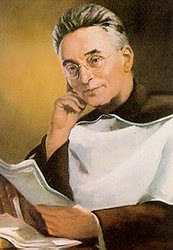 Christopher Rengers, and The Way of Perfection, by St. Teresa of Avila both jumped out at me and demanded to be bought. So did Fatima from the Beginning, by John de Marchi, and The Art of Dying Well by St. Robert Bellarmine. 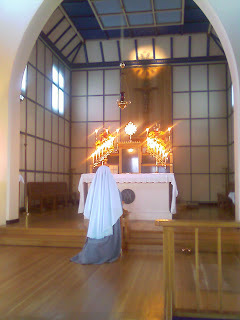 After lunch, the Blessed Sacrament was exposed. There was another outdoor procession, this time of the Blessed Sacrament. Again, I stayed put and prayed quietly. Fr. Tim took the opportunity to take some photos while finishing off the parish newsletter. 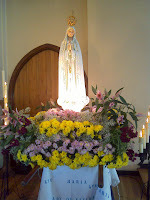 We prayed the Rosary when everyone returned (the Luminous Mysteries) and then we had a sermon on Our Lady by Fr. Agnellus, FI. I posted before about Fr. 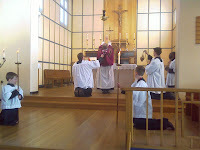 Agnellus when he came to celebrate a first Mass at Blackfen. The main thrust of the sermon was that we needed to pray for fortitude during Lent, to enable us to complete our Lenten observances, and that Our Lady was ready to help us if we asked her; she was a supreme example of someone who displayed fortitude. 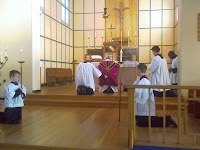 This was followed by a short period of silent Adoration, and then finished with meditations on the Stations of the Cross. 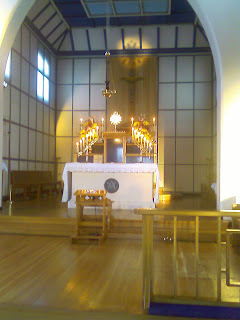 We stayed in our places for this - the Blessed Sacrament was exposed, and anyway, there were way too many people to be able to walk round the Stations. A brief tea-break was announced: as the Blessed Sacrament was still exposed, many people just remained in the church to pray quietly. 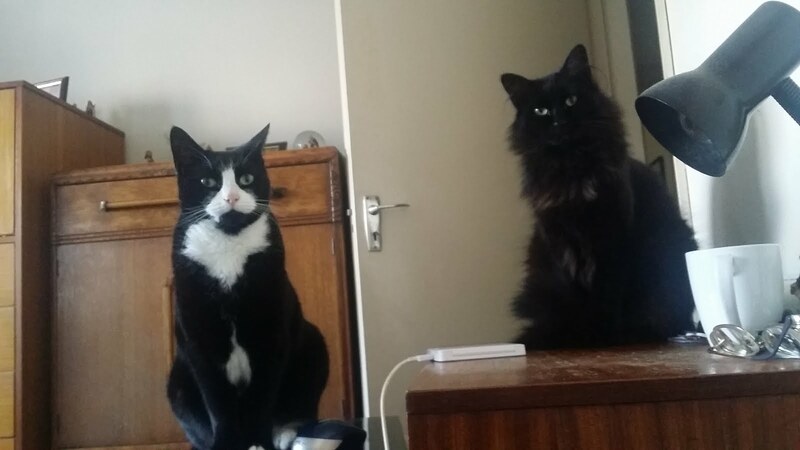 Some went out for a quick cuppa and then returned. 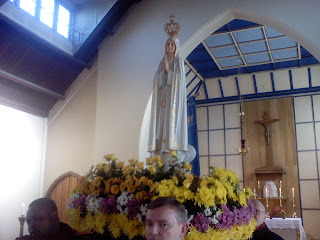 We then had another sermon on Our Lady from Fr. Tim. This time he spoke about how we should give everything to Our Lady. It was all or nothing: either it was completely right to give ourselves to Mary, or it was completely wrong. If we needed to "save" something of ourselves for Jesus, then we shouldn't give anything at all to Mary. In fact, we give everything to her, because she gives everything to her Son; and with Mary, we contemplate the face of Christ. 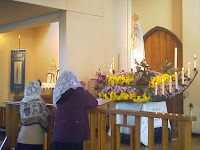 The Glorious Mysteries were prayed, followed by Benediction, and then some people were enrolled in the Brown Scapular and the Miraculous Medal. 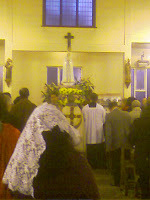 Finally we waved farewell to the statue of Our Lady with white hankies provided specially for the occasion. ...but very happy. The Day With Mary went really well. I wasn't going to take photos, but it was such a great opportunity that I just couldn't resist. I was using my dinky little phone camera though, so no annoying clicks, and there isn't a flash, so my photo-taking was fairly discrete. It helps that I like to sit at the front. 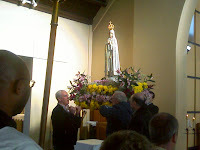 We started with various prayers, the Crowning of the Statue, the Litany of Loreto, and then an outdoor procession with the statue of Our Lady, just once round the block. Yesterday I'd been on a team-building-bonding type of INSET at an outdoor activity centre... not my cup of tea at the best of times. We've had a fair bit of rain recently, the ground was muddy and slippery, and I wrenched my dodgy ankle several times. Today I was in quite a bit of pain, so I skipped the procession and stayed behind in the church praying the Joyful Mysteries, while the procession prayed them outside and sang a couple of hymns. 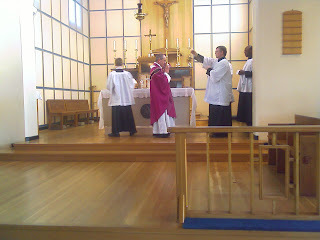 We then had Mass. 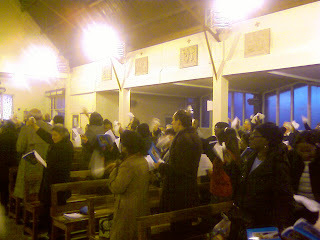 It was a Missa Cantata - I was delighted that we didn't have to forego the Extraordinary Form this Saturday. 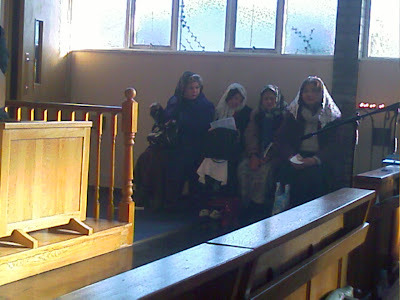 Hopefully the photos will convey a little something of the beauty and solemnity of the occasion. Fr. Tim preached a very good sermon on the importance of prayer for the Holy Souls (particularly getting indulgences for them) and guardian angels. I knew that each person had a guardian angel "for their very own" as it were, but I hadn't quite grasped the idea that each country has an angel guardian, and even each parish (Fr. Tim reminded us that the guardian angel of Portugal preceded the apparitions of Our Lady to the children in Fatima.) 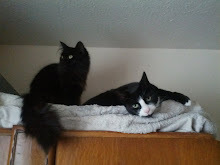 That gave me food for thought, and I shall make more of an effort to recruit them when I need help! I'm whiling away a little time (Ok, I put too much hot water in the bath, and rather than let some out and add cold water I decided to let it cool down a little) and I've spotted this meme over at Exspectantes' blog... she basically tagged anyone who wanted to play, so that's my excuse! 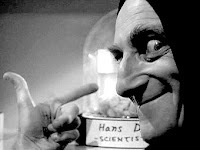 U - Undertaker: I had to visit one in order to overcome a coffin phobia. R - Really, I am a natural blonde... though I colour my hair to make it slightly lighter and more ashen. S - Steak: I like mine medium-rare. U - Uvula: mine is divided so that I have two little "bits" hanging down at the back of my throat. L - Liturgy: I prefer mine traditional. A - Accident-prone. Not unduly, but enough to make me slightly wary. And now I'm going to tag Karen, Ma Beck, Fr. Paul Harrison, Mark, Rita and Ttony. Tomorrow we have our parish's Day With Mary. 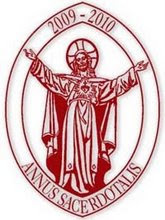 Last year's celebration was really great... just about every possible devotion to Our Lady, the Holy Sacrifice of the Mass, Adoration of Our Lord and Benediction, plus the opportunity to go to Confession... Wow! Heaven's arrived early! -- Al Gore, US Vice-President. -- Department of Social Services, Greenville , South Carolina. -- Mark S. Fowler, FCC Chairman. I don't know how genuine these are: they were sent to me in an email... but they made me chuckle so I'm posting them anyway! It was the boys' Confirmation class tonight (the girls have theirs on Tuesday) and one of the catechists asked what Lenten penances were being undertaken. One lad piped up about how he was going to give up chocolate. All fine and dandy. 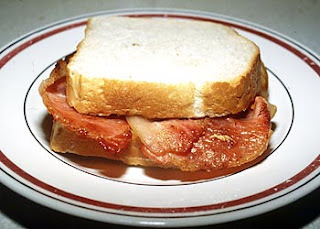 ...I really like bacon at the best of times, but Ash Wednesday and Good Friday are the two times I seem to wake up dreaming about it... Believe me, catfood never looked so appetising as it did this morning! And I'm not the only one whose thoughts stray... The Curt Jester decided to post a little detachment test for people to check out how well they're doing! Next is Leutgeb... she counts as England & Wales because she lives in England, but has Welsh spotty bread as her blog name. Esther gets the Hawaii slot. Ummm, is that actually part of the USA? There are so many blogs I enjoy reading, I couldn't possibly manage to name them all, and I've probably offended several people. If you want to be tagged, consider it done, but let me know in the com-box. I was ashamed to see that the House of Lords has approved the Human Fertilisation and Embryology bill on Monday. They didn't even put it to a vote... it was just passed through on the nod, so-to-speak. John Smeaton, Director of SPUC, has more information on the (unsuccessful) attempts to introduce amendments which would restrict the bill. 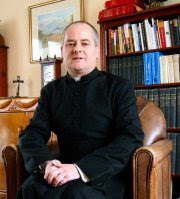 In 1996 I wrote an article for Faith Magazine outlining the dangers of foetal tissue transplantation - that is, the use of foetal nerve tissue to repair brain injury. My knowledge of the subject came from my research work at the Institute of Psychiatry: it was one of the leading centres for research into foetal brain tissue transplantation in animals, though the work always looked towards the possibility of its use in humans. The more I read about the work on human foetal tissue transplantation for the article, the more sick I felt. The very real spectre of women being paid to have abortions "at the right time" was looming, and it struck me that we were on the edge of a very slippery precipice. It would appear that British research is now leading the rest of the world in this field: a fact that the Government announce with pride. They fail to mention that this field is one pretty much shunned by the rest of the world. This is nothing to be proud of. Someone ought to point out to His Lordship that the fastest way to reduce global warming is to stop pontificating on subjects of which he knows little or nothing... all that gas and hot air must be contributing significantly to the greenhouse effect! I pointed out that Fr. Tim had handed me his camera before our parish Candlemas celebrations. Well, he's managed to put together a "video" of the results. Some of the shots are a bit shaky... that camera weighs a ton, and this time I didn't have a tripod. Esther, that Catholic Mom in Hawaii, has tagged me for a new book meme. I don't quite know what I could have done to offend her... though maybe it's because I didn't tag her for my last book meme, and this is her idea of revenge!! 1. What book have you read in the last six months that has really stayed with you? Why? The Spiritual Combat and a Treatise on Peace of Soul by Dom Scupoli. He hits the nail right on the head when describing temptations and our (ok, ok... my) excuses for giving in... and he also provides helpful advice on how to fight back. 2. What is one of your favourite childhood books? 3. Do you have a favourite book of the Bible? 4. What is one book you could read again and again? True Devotion to Mary by St. Louis de Montfort. Reading about Our Lady is awesome. 5. Is there a book you would suggest for Lenten reading? What is it and why? The Sinner's Guide by Venerable Louis of Granada. For much the same reason as The Spiritual Combat. It also has nice short chapters which can be tackled one a day. Bonus question: If you were going to publish a book what would it be? Who would you want to write the jacket cover blurb expounding on your talent? I have enough difficulty trying to think of what to write for my blog, let alone a book. Ok, I'm going to tag Karen (she said she likes book memes) and Ma Beck... and anyone else who wants to play - provided you tell me in the com-box. I was lucky enough to go to lunch with Fathers Zuhlsdorf and Finigan this afternoon. Congratulating myself on my good fortune, I tried to do more listening than talking (a feat I find rather difficult most of the time, and I'm not entirely sure that I succeeded) while making short work of my last steak before Lent. We soon moved on to the discussion of blogging matters. Again, I was basking in a nice warm fuzzy feeling as I listened... after all, I too have a blog. Then my comeuppance. 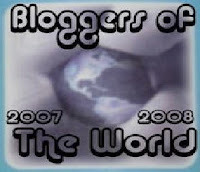 The two überbloggers started talking about another blog. "Imagine," they chortled merrily, "...only 200 visits a day!!!" "Feeling totally inadequate" just doesn't cover it!